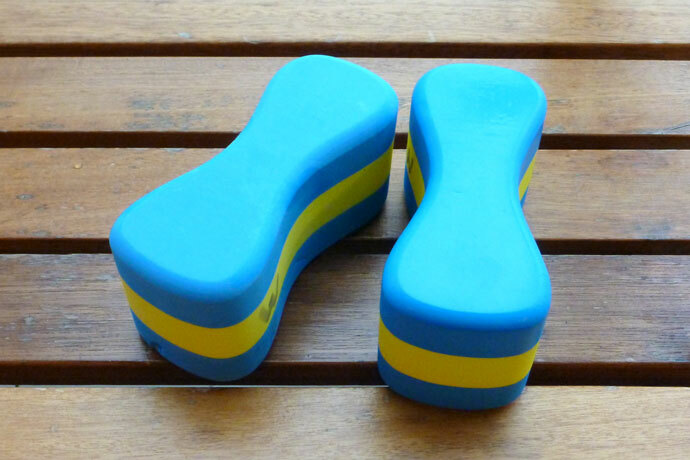 Pull buoys are flotation devices designed to keep your legs up. To do so, you place them between your thighs. They can be of great help to beginners which haven’t yet mastered a good horizontal position in the water. Pull buoys should primarily be used as a tool to support the legs while learning the arm movements in the breaststroke, backstroke, front crawl, etc. As the legs are supported, you can isolate the arm movements while learning the new swimming stroke and only use a small flutter kick or no kick at all. For example, see how to use a pull buoy while learning the sidestroke. Pull buoys are often touted as training devices to help improve upper body strength and balance in the water, especially when combined with swim paddles. However, I tend to disagree with these uses for the reasons explained below. A few years ago, I had an ankle injury which took several months to heal. During that time, I resorted to swimming front crawl with a pull buoy to avoid using my injured foot and straining the ankle. However, this had an unintended side-effect. Because my body’s position was more horizontal in the water with the pull buoy, during the arms’ underwater recovery to the front, I had to extend them higher than I was used to. After a few swim sessions, my shoulders became sore. It seems the additional extension of the joint strained my shoulders. Since then, I avoid using a pull buoy while swimming laps. You need to keep in mind that your arms will do less work when you use a pull buoy because of the more horizontal position drag is reduced. So much for using a pull buoy to improve upper body strength. Another problem is that pull buoys do not improve balance but do instead mask balance problems. Often, swimmers that have bad balance (meaning that their legs and hips drop in the water) use a pull buoy to compensate. However, using a pull buoy doesn’t teach a swimmer how to make the legs and hips stick to the water surface. If you need to improve balance, practice these swimming drills to learn how to keep your hips and legs up while swimming front crawl (or backstroke). Another use of pull buoys to avoid is holding them in front of you while doing kicking sets or using them as swim paddles. The pull buoy will keep your arm very close to the water surface while the shoulders will drop deeper in the water. This unnecessarily strains the shoulders. Sometimes pull buoys are asymmetrical, meaning one end is larger than the other one. My experience has been that placing the larger end so that it points towards the ceiling while swimming provides the best support and stability in the water. But remember, your mileage may vary. If one pull buoy doesn’t provide enough support while learning a swim stroke, simply place a second one between your legs. This should provide more than enough support for your legs. If you use pull buoys to help you isolate your arm movements while learning a new swim stroke, you should be fine. 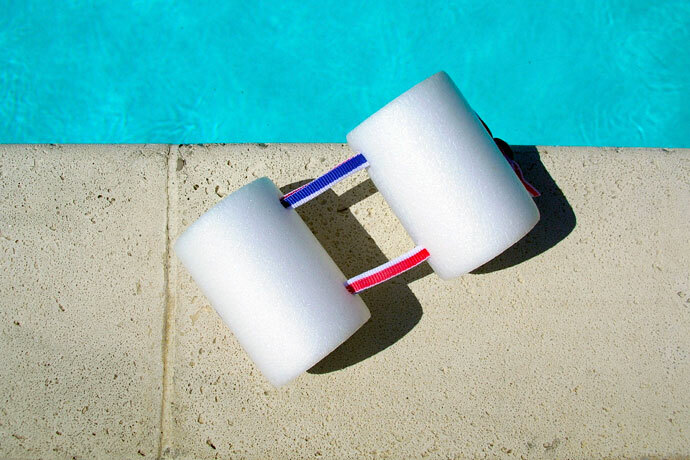 But be careful of using them while swimming laps because they can mask balance problems and strain your shoulders.